Skeleton Technologies is to supply graphene-based supercapacitors to Milrem's multipurpose UGV (unmanned ground vehicle) to be showcased at DSEI 2015. Milrem (Military Repair, Engineering and Maintenance) is an Estonian company whose mission is to be a partner in the defence and security sector, offering flexible product development solutions and full life cycle support for heavy vehicles. 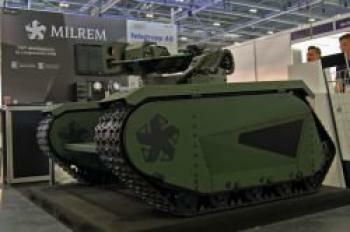 Milrem is also developing a mobile command post and an unmanned tracked vehicle for military purposes. Skeleton Technologies' high power cells will be used to deliver energy efficiency and product reliability to the UGV, which can be used for a wide range of defense requirements including reconnaissance and observer missions, targeting weapon systems and providing support solutions such as medical supplies. The universal platform allows operators to optimize their vehicle fleet and reduce life cycle management costs with simplified maintenance and spare supplies. A sophisticated control unit regulates energy flow between the diesel generator, electric motors and Skeleton Technologies’ supercapacitors. This system reduces overall energy consumption by 25–40%. The supercapacitors also ensure reliability by starting the vehicle in cold conditions or after prolonged periods in storage.